Selectabed began with memory foam mattresses, such as the Tri-Pedic, which provided pressure relief for many users. But memory foam alone was not sufficient relief for people with special conditions, such as fibromyalgia, so Dr. Swartzburg designed the Fibro-Pedic, a mattress for people with fibromyalgia. This is a hybrid of memory foam and latex, predating the original Casper Mattress by several years. The 9” high Fibro-Pedic is a 3-layer mattress. Each layer is 3” high. The Fibro-Pedic mattresses is covered with Selectabed’s patented Kool-Flow fabric, a blend of rayon from bamboo (43%), polyester (56.4%), and lycra (0.6%). It is a conforming knit with knitted-in Micro Vents to let more air flow through. 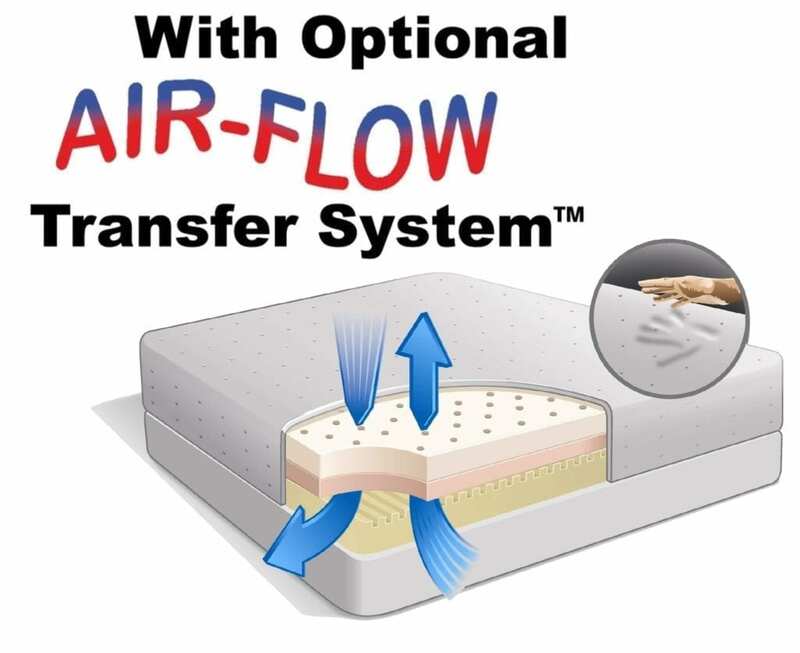 This is a feature of the patented Airflow Transfer System (see below), which is an option for Fibro-Pedic and other Selectabed mattresses and a standard feature of Snuggle-Pedic and TempFlow mattresses. The 3” top layer of the Fibro-Pedic is soft 4-lb. memory foam to ease pressure on sensitive areas (“muscle pressure points”) of a fibromyalgia sufferer’s body. It yields to body weight more quickly than 5-lb. memory foam, which does not yield until it warms up. Since the lesser density memory foam does not accumulate heat as much as the denser foam, it is also cooler. The middle layer is 3” of composite (blended natural and synthetic) Talalay latex. The firmness in this layer is zoned – firmer in the middle, softer at the ends – to provide more support to the heavier part of the body and softer support to the lighter areas. This is to keep the heaviest area from pulling the back out of line (see illustration below). 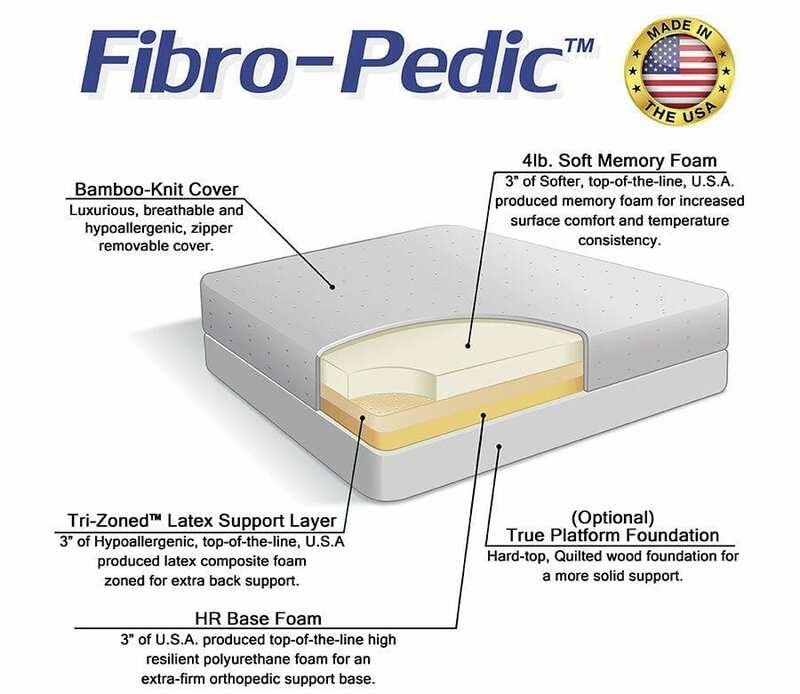 The 3” base of the Fibro-Pedic is very firm high-resiliency polyurethane foam. Its role is to keep the sleeper from bottoming out with the softer foams above. This option for Fibro-Pedic mattresses is standard in Tempflow and Snuggle-Pedic mattresses. Air flows in and out through numerous Micro-Vents in the Kool-Flow cover. It then flows through vertical perforations in the upper layers and horizontal air channels in the top of the base support layer. Airflow not only cools the mattress, it also controls moisture, inhibiting the growth of mold and bacteria. The sleep trial for the Fibro-Pedic mattress is 120-days, longer than for most other memory foam and/or latex mattresses. For instance, most traditional brands have 90-day sleep trials, while those of many of the start-ups are for 100 or 101 nights. Fibro-Pedic is covered by a 20-year warranty, twice the now-standard 10 years for most other memory foam mattress and latex mattress manufacturers, including Tempur-Pedic and Casper Sleep. Fibro-Pedic latex-memory foam mattresses are sold only in the Selectabed store and online from Selectabed’s website and made-to-order for specific conditions. There are only four customer reviews on Reseller Ratings, and only two evaluate their mattress experience. All are 5-star ratings. Beds.Org has a staff review of Fibro-Pedic, but no customer reviews. Fibro-Pedic is covered by some independent writers. 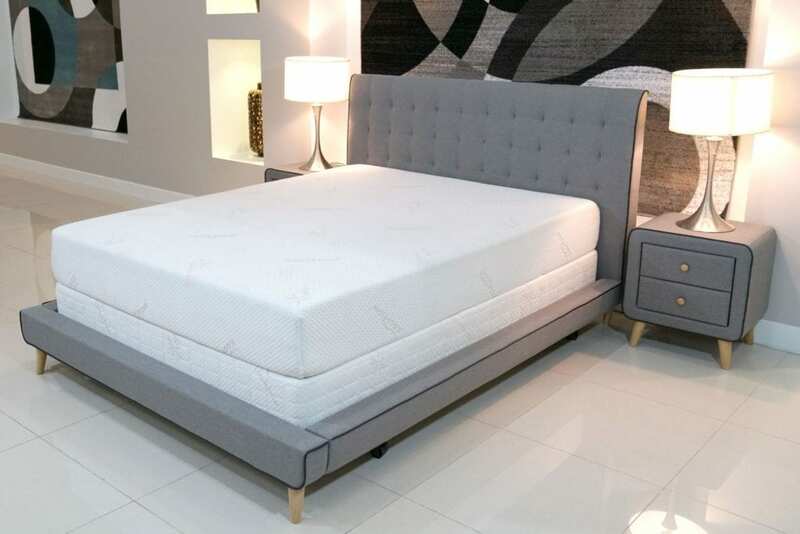 Choosing a Mattress for Fibromyalgia, an article on New Life Outlook, has Fibro-Pedic as one of the three top mattresses for fibromyalgia sufferers. A conservative rating estimate could be 4.6 stars. The writer of the blog ButYouDontLookSick tells how the Fibro-Pedic relieved her fibromyalgia symptoms in the equivalent of a 5-star review. Viewpoints has an article, “Fibromyalgia: Finding the Best Mattress,” which lists the Fibro-Pedic among those for people with fibromyalgia. It says a chiropractor created this mattress for his wife who had fibromyalgia. There is a Fibro-Pedic reviews page. If someone has fibromyalgia and uses this mattress, they can post their review there. Users report that the Fibro-Pedic has both the soft surface and the underlying support they need. One said he was “able to rest and sleep comfortably.” No one listed cons except for a delivery problem which was resolved. Averaging these yields an average rating of 4.9 stars (98%).